Today, rugby is played in hundreds of secondary schools in Kenya in all eight provinces. There are secondary schools competitions all over the country for both 7s and 15s. There is also a national championships in both editions of rugby and the winners and runners up of the national championships gets to represent the country in the East African school games. Rugby may be widespread today however this has not always been the case. Much like international rugby which for decades was the preserve of a few elite countries, schools rugby was for nearly 4 decades, the preserve of a few schools, mostly those that were formerly reserved for Europeans during the colonial days. The schools were Lenana, Nairobi School, St Mary’s, Strathmore, as well as schools for expatriates: Rift Valley Academy and Hillcrest. All these were schools based in or around Nairobi. group winners as well as the best overall runner up qualify for the semi finals from where two teams contest for the Prescott Cup. The Prescott Cup was an all Nairobi affair until 2010 when the Kenya Rugby Union made it a national affair, ensuring schools get to further hone their skills by playing more matches on a more frequent basis. St Mary’s school is a private catholic school based in Nairobi’s affluent western sections. It is popularly known as “Saints”. It has a rich rugby tradition that has seen it win the Prescott cup no less than 10 times. It has produced several Kenya national team players including Paul Odera, Benedict Nyambu, Allan Hicks, Biko Adema, Charles Cardovillis, Edward Kinyany and John Allan Namu. Each year, St Mary’s school hosts the Blackrock rugby festival which brings together schools from all over the country. Its is the largest and most famous one day rugby event in Kenya. the best rugby player Kenya has ever produced, Edward Rombo. Patch also produced the first indigenous Kenyans ever to play for the East African rugby touring team, the East Africa Tuskers. The two were winger Ted Kabetu and prop Chris Onsotti. This was in the early 1970s. Other Patch products who have played for the Kenya national team are stars of the Kenya national sevens team, Paul Murunga, Ian Simiyu and Felix Ochieng legendary two sport star , Joe “JJ” Masiga who also played for the Kenya national football team in the early 1980s, along with others like Eric Kibe. Ndeda Thomas Opiyo, Roger Akena and Sammy Khakame. Lenana School were the winners of the inaugural national schools championships when they beat Kakamega High School 36-6 in the final at the Nairobi School in 1990. You cannot discuss the Prescott cup without mentioning Rift Valley academy, a school for children of expatriates based in Kenya. RVA once won the Prescott cup 10 times in a row between 1980 and 1990. Then there is Strathmore who though do not have a strong rugby tradition, was competitive in the Prescott cup and produced many national team players like former Kenya sevens players Gabriel Ouko, Curtis Olago, as well as others like Wilson Kopondo, Alois Odhiambo and most notably Daniel Adongo, the first Kenyan to play a top tier rugby union league (South Africa’s Currie Cup). due to the efforts of one or two teachers. Once said teachers leave, the school’s performance on the rugby usually plummets. Not to worry however, Njoro’s place has been taken by other upcountry schools, most notably Kakamega high school, Maseno, Musingu, Nakuru high, St Marys Yala and Mangu. Kakamega high has excelled in sevens so much that they have been invited to play in the Dubai sevens youth section. The school has gone on to produce some of the best sevens players in Kenya like Dennis Mwanja, Oscar Osir, Allan Makaka, Humphrey Kayange and Fabian Olando. St Marys Yala products include Ted Omondi and Lesley Mango both former members of the Kenya national sevens team. As the first decade of the new millenium drew to a close, Mangu appears to have taken the mantle as the best rugby school in Kenya, having won the national schools championships in 2010 and 2011. This entry was posted in Kenya Rugby Articles. Bookmark the permalink. I think that should actually be “Patrick Wakhu made history when he played for the Kenya national rugby team, and the regional touring team, East Africa Tuskers in 1981/82”. In 1981 Patrick Wakhu was in Form 6 at St. Mary’s School Nairobi. Patrick Wakhu also played in the first Kenya vs. Zimbabwe match, the latter’s first international game as Zimbabwe on 7 July 1981. Kenya lost the game to Zimbabwe 34 to 24. Patrick Wakhu then toured Zambia and Zimbabwe in 1982 with the East Africa Tuskers in what I believe would be the last Tuskers tour. Tuskers beat Roan Antelope 25-6 in the first match. We also beat Ndola Wanderers 20-3, lost 40-19 to Matabeleland, beat Midlands 35-16 before losing to the Zimbabwe national team 15-12. I was in the 1983 Team that was runners-up in the Prescott Cup to RVA. 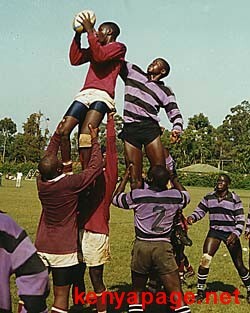 Please forward me the u.19 -rugby playing school list of Kenya – detail to include: School name // email address. lenana school rugby 1980 to 1985 we played well check your history i was no 9 scum half with jim wakhu fred luseno walter abila amongst the best rugby players kenya has ever had. Kettienya was an excellent No.9,fast, creative,not to mention brave for his slight frame. Kettienya, Waku, Luseno, Fred Ojiambo,Kavila, George Adul,Osir,…… etc were the stars of the day during this period. I think Lenana School is rising again. Last year(2014) we took the 2nd place in Press ot. schools like simotwo are comming up they should be motivated! Is there any schools in Kenya that may be interested in appointing a coach from South Africa. Interested!! !